Jordan Spieth recently switched putter grips. AUGUSTA, Ga. — Jordan Spieth replaced the most beaten-up piece of equipment in his bag in the run-up to the Masters. The natural reaction would be to assume the three-time major winner had a change of heart and shelved the well-worn Scotty Cameron 009 putter he’s used almost exclusively since junior golf. But the putter still resides in Spieth’s bag this week at Augusta National. It’s actually another piece of gear associated with the putter: the grip. 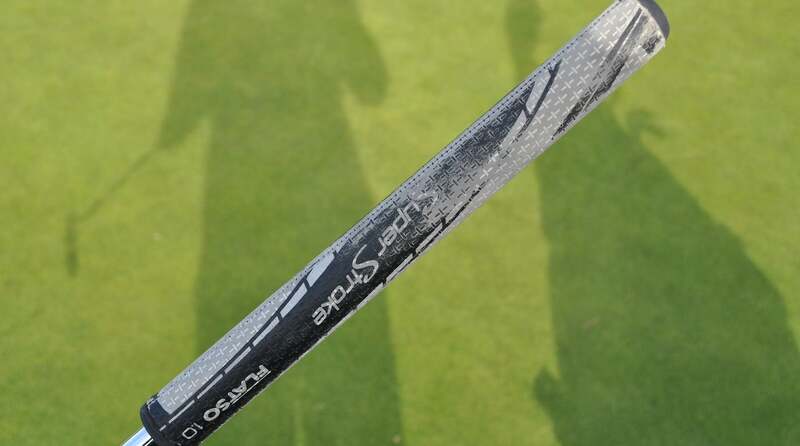 With the outer rubber layer fraying around the end cap and the SuperStroke logo looking almost unrecognizable from hours upon hours of use, Spieth’s putter grip gave off the appearance it had never been replaced. A photo of Jordan Speith's old SuperStroke Flatso 1.0 grip. In actuality, Spieth hadn’t changed the SuperStroke Flatso 1.0 in nearly two years — an eternity for professional golfers who typically replace putter grips at least once per season. In other words: It was time for a change. Working with Arnie Cunningham, SuperStroke’s Tour rep, in San Antonio, Spieth shook things up and gave SuperStroke’s Traxion Flatso 1.0 grip a shot. The updated version of Flatso 1.0 isn’t all that different from what Spieth was using previously. The grip features five pronounced edges with a wide, flat front and SuperStroke’s surface texture Traxion design that’s designed to enhance feedback and feel through X-shaped zones on the polyurethane outer layer. While Spieth’s grip has an opening in the end that can house a counterweight, Cunningham confirmed Spieth, like Dustin Johnson, prefers to use it without the weight, giving it a more traditional feel. The timing of the grip change is odd given Spieth’s success at Augusta National, but considering he’s currently 70th in strokes gained: putting on Tour entering the Masters, now feels like as good a time as ever to shake things up and see if a different feel works on the greens. The results were positive for Spieth in his first start with the grip, as he finished 28th in strokes gained: putting last week.